Downloaded the ver 2 as understood too many problems with the first. Initial start up OK but as plug ins and scm added more problems. Start up interrupted by statements of no function known, hit any key to continue and some that hang for a long time before continuing. Have Demo.exe that appears and must be deleted before continuing. When start up finally finished, all looks OK, but plugins that were added on first start up only stay until computer turned off. When Gimp started again, go through all the same start up problems but the added plug ins are not there. It is though they were never added by using Edit/Preferences/Plugins. I have not had this problem with any versions of Gimp before. I have completely erased it, re downloaded repeatedly but continue with this problem. 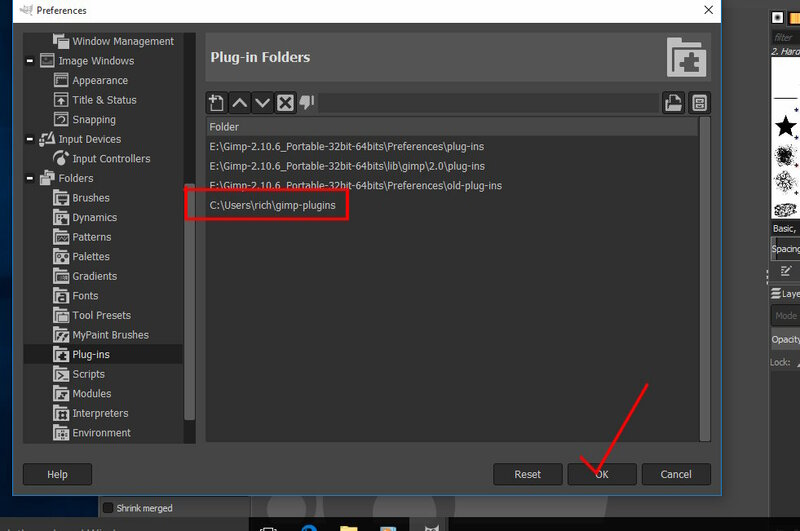 If the added plug ins are not in the original system and profile folders, they disappear. This goes also if a subfolder has been added, it disappears also. They seem to work properly when they are present. Am I missing some files? Has anyone else had this problem? I tried reporting it, had a few replies, but then I had notices that their server would not accept messages from me. Asked for help but no reply. I am using Windows 10. 64 bit Have Gimp 2.8.22 reg version still on my computer. I have installed the Samj Gimp to the desk top to separate it to another directory. Rich, the type of folder that you suggest will probably not be there the next time I start Gimp. It was not an installed folder in edit/preferences/plugins that was native when I first installed the portable version of Gimp. Is there a limit as to how many folders can be added in edit/preferences? I will try your suggestion and see if it makes a difference. Pat, can you post the equivalent of these snapshots of my environment (Samj's 2.10.8 ver.2 64bits also)? I don't have your problems. As you see, I didn't add plug-ins folders in the Preference folder of Samj's pack, all plug-ins folders in my case are external and just linked. Thank you for answering. I originally tried having all the plug ins external to the preferences but it really did not matter. The next day they were gone. However, I have deleted and installed so many times that I will try that again. As it still has interruptions during start up, I fear that I might have some missing files. samj 2.10.6 is a portable Gimp and self-contained, so if starting from fresh will have all the files. Just a matter of unpacking and/or copying to some location. But it is a monster 500 MB, thousands of files so opportunity for mishaps. My try-out yesterday and it is portable. Does not copy over existing Gimp 2.8 resources like a fixed installation. It should not suffer from the problem of old Gimp 2.8 incompatible plugins (such as gmic) being present. Rich, I have not replied as I still do not understand what is going on. I have not done anything different than what we have already discussed and there has been substantial improvement. I have two times that I have to "hit any key" to resume start up. Also, decreased amt. of times that the edit/preferences/plug in folders disappear. Hope I have not jinxed it by reporting this.